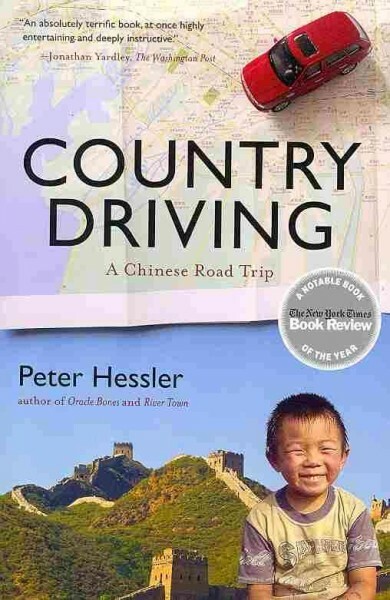 Country Driving: A Chinese Road Trip by Peter Hessler, published in 2010, is one of those books which seems to have sat on my shelf much longer than it should. After reading another book by Hessler, River Town, I was looking forward to what I viewed as a sequel. In a way that is what Country Driving is, but it is also much more; three books in one, to be exact. Hessler’s Country Driving is about the author’s time traveling through rural China. Separated into three individual stories – traveling along the Great Wall of China, outside of Beijing, and in the factory region of southeast China – the book is a strong piece of memoir and narrative journalism describing modern day life in China through the author’s own experiences. It is a detailed, thought-provoking, and engaging account of one of the most fascinating countries in the world. The parts of Country Driving which I found the most interesting were author Peter Hessler’s personal interactions with people whom he wrote about. I enjoyed the stories of him driving along the Great Wall, but as he did not have a deep emotional investment in the story, I found it lacking compared to the other two stories. The two – one where he spends his weekends in a developing rural city outside of Beijing and another where he is in the factory region of Southern Zhejiang – I felt I connected with him and his story on a different level. Peter Hessler is an accomplished author; at the time of Country Driving’s publication, he wrote two other books, was a contributor for National Geographic, and a staff writer for The New Yorker. This shows in this book, too, as at times the reading can be somewhat tedious, as though it is an overly long National Geographic article. While the stories are all most certainly thorough and well-developed, sometimes they just feel long, and unedited; each chapter is approximately 50 pages, which can make it difficult for a busy person to read in one sitting. Despite the length and sometimes tedious feeling of the three separate stories, I enjoyed Peter Hessler’s Country Driving. I thought it a fascinating look at life in rural China, a place I spent all of a day in while visiting Beijing years ago. It is a book which is right up the alley for anyone with an interest in traveling to or reading about China, particularly those who like The New Yorker or National Geographic.